What in the world is sales enablement and what does it mean for the growth of your company? This Grow Live episode is a very special one indeed. Today, Matt Johnson is joined by Natalie Lane and Misti Ferris to talk about how these very important tools can not only help everyone reach their quotas, but help to align your sales and marketing departments. Read more now to hear the very helpful insight offered by key members of the Spinstak team! What is sales enablement anyway? “Close the feedback loop between sales and marketing,” — Matt Johnson, CMO & Managing Partner at Spinstak Growth Agency. Today’s call to action: Share your sales processes and experiences in the comments below and you could win some swag. Don’t miss next week’s show! Next week, we’ll discuss budgeting and tracking your return on investment! See you there! This week on Grow Live, we're gonna answer the question, "What in the world is sales enablement?" Let us know what you think on the comments below. Yay! Hi, Natalie, Director of Marketing and Product Development. ... and Misti, thanks for joining us. Hey guys, I'm Misti, I'm an account manager here at Spinstak. Woo-hoo! As I pull an amateur move and turn my phone to silent. But today, guys, we're going to jump into the exciting topic of sales enablement. So, we're gonna have a conversation about the idea of what sales enablement is, how it can relate specifically to safety industrial MRO suppliers and distributors, or what we've seen in working with those types of businesses, and maybe we'll share some ideas about what we think could really benefit those types of companies and help them grow their business by better aligning sales and marketing. So, that's what we're excited to talk about today, but before we get into that I just want to make a couple of quick announcements. If this is your first time joining us, we are on a couple of different channels, so you can choose your poison. You can catch us on YouTube by just searching Grow Live or @SpinstakTV, you can also catch us on the podcast, and ... Yeah, that just happened again. Oh, you're calling me right now. All right. You turned the ringer on. Sorry, first time I used a cell phone. So like I was saying, you can catch our podcast, which is found wherever podcasts are delivered. You can rate us on iTunes, that would be fantastic. You can also come back and see the show notes on our blog at Spinstak.com. And I would just like to say, if you would rate us on iTunes, share the show, comment on the show today, tell us what kind of sales enablement are resources and processes you are using at your business, we would love to see that. We would love to engage with you, and we'll send you some swag. So, it's a win-win scenario. Yeah, or anything else you might want. Okay guys, so let's jump into this conversation today. Sales Enablement is a hot topic in marketing circles, Natalie. So do you want to kind of give everybody kind of a quick overview of what sales enablement is? Because that might be a term that maybe your listeners are hearing for the first time. Yeah, it's like the topic that we have today, it's "What in the world is sales enablement?" Because it sounds really fancy and it really ... it's not that fancy. It's just a fancy way of saying, "Here's a program that includes all of the tools and resources that your salespeople need to be able to sell effectively." Did you know when I type in enablement into like a word doc or something, it actually comes up as an error. Like, that's not even a word. I don't think ... Word has decided that that's not even a word, yet. So, we made it up, like a good marketer, we just made up a word. It's a good way to kind of point out that there's so much jargon in marketing. And for our industries, we should really limit that, so it's easier to understand and it doesn't seem so daunting to put something ... like create something like sales enablement into your business development processes, because actually it makes sense and it's very easy to follow. ... But it's a container for your employees to follow. Think of it as an outside guideline. So, it's funny because sales enablement can mean a lot of different things, and I think you guys talked about a couple things. Being in marketing for years, myself, I've been doing this for a long time and I never really had a name for it. It was pretty much just the idea of creating tools and resources for our sales team, or outside salespeople. So, the idea here is that marketing, one of marketing's key functions is to come alongside the sales team and serve as that other half that is creating collateral, that is creating and managing tools like maybe a CRM, creating processes and other types of material that's actually going to help the sales team do their job better. So this isn't training the sales team, necessarily. This isn't teaching them how to be better salespeople. I think that's where it could become off-putting for a lot of people. So, we're not saying that. I think what we're saying is how do we come alongside of sales and provide them with the things that they need to be more effective at their job. Right and I think yeah, not training them how to be better salespeople, but training them on how to use the tools that they're getting. I mean, they have a lot of input in the tools, the materials, and the resources and the communications that go into the sales enablement program that we'll talk about, but showing them how to use them effectively is definitely a training aspect of it, I think that's important. Well, I think that that's valid because you see a lot of traditional salespeople who are very good at face to face sales or they're good on the phone, but when it comes to utilizing software, that's where they tend to shy away from it. So I think companies understand, especially ownership, C-Level, they understand the value of automating things, they understand the value of getting smarter, using data to drive decisions, and so they're investing in software and technology. But there's this real conflict, because there's a fear that it'll be difficult to adapt their sales force, which is more traditional, to the new technology. So have you seen that sort of thing, Misti, in your experience working with companies like this? Definitely. And Natalie nailed the key word there, it's communication. You have to get the sales team involved in the process. You can't just lay it out and say, "Here's what you're going to do." You need their input. It's valuable input. They're the ones working with your customers, so they can tell you which parts of the program make sense, and which parts don't make sense, and opening up that line of communication will give them the feeling that they're part of what's going on. It's their idea as much as it is the marketing team's. That's where Smarketing ideas come into play. You should go back and check out some of those episodes if you haven't seen them ... But really aligning the two teams, on all platforms, will help you be able to present an enablement program in a way that they're going to be receptive to. Sure. Yeah, absolutely. I mean, it goes beyond creating the brochures and the sales sheets that they can take for those face-to-face meetings. It's also getting their input on how they want their emails worded so they sound very personal for the follow-ups and those automated campaigns, so that they don't necessarily have to worry about those things ... because that's like the biggest thing, they worry about that follow-up, and a proper sales enablement program will help them be customized, I guess. Yeah, and that's because their salespeople. They don't want to seem like robots. They love personal connection. And as long as they know that the program isn't going to take that away, I think that's something that would kind of open the doors for them to be excited about it. Let's talk about some reasons why they might want to consider. So, pretend like I am a traditional salesperson, and I have my handful of accounts that I've known very well for many years, but I'm also getting pressure from leadership to go build some new business. So, spend a little less time on the existing accounts, but I also still want to make sure that they know I'm here and that I'm taking care of them, but I need to go and build some new business. How can sales enablement tools like a CRM, like automation, how can those things help me do my job better? So, with the use of a CRM, a salesperson would be fed in qualified leads. So, they would get a list of leads, and they could use ... whether it's template in sequence emails, or even if they just add in to their own personal emails there could be some resources, maybe blog posts or shareable content in some format, that they could begin an open dialogue with that new lead. Depending on how the dialogue goes, that lead could be dumped into to continue marketing to them in an automated format, or it may turn into something where they're ready to move forward in the sales process and get closer to closing that deal. Right. Okay, awesome. What do you think? Well ... I think from, if they're going from ... like that farming to hunting, and using sales enablement as a way to reach those those prospects, it helps them just create a warm funnel, not a cold funnel. You know what I mean? It turns it into a team effort that is very personalized for the salesperson. The salespeople need to work more in line with marketing, that's where the head of marketing and head of sales need to actually work together and get their teams on the same page. This is a great way to do that, by the way, and I don't think it happens very often. It's more important now than ever, because of the big box and the Amazon of the world, where relationships are less valued as maybe they had been in the past. And so, the companies that really do appreciate those personal touches are going to be more sticky to your brand. And so one of the things I like to say is that you have the ability, with maybe some basic marketing automation tools and a CRM, to continue the service and touch your existing customers on a regular basis, completely automated. And then, when they're ready to engage with you. So let's say that you have an email sequence that's set to touch your customer twice a month for the next six months. Okay? And that thing is running automatically. You set it up the first time, you write those email templates, you set it up and you just let it go. And then when a customer is ready to engage with you, maybe book a meeting with you or place an order, they'll let you know. So, you can be reactive. But meanwhile, since you've automated that whole thing, now I have time to actually go knock on some doors, make some cold calls, and drum up some new business. And so I'd like industrial sales people in general to start thinking about, "How can I automate 50 percent of the work I'm doing now with my existing customers, so that I can take that newfound time and dump it into finding new business?" So that you can actually start growing. And I think what you'll find is that your competitors are struggling with this, as well, and this is an opportunity for you to take accounts away from other competitive companies because those companies are struggling because they don't have the automation, so they struggle to even touch their customer once a quarter. Right, and I think I think they're not seeing it because most people in this industry see marketing as one channel and sales as a different channel, and they're like oh, marketing is fancy social media, and it's email campaigns and this that and the other, but they're not seeing that tie-in and they're not seeing the value. So they have all these marketing assets they've created on one side of the table, and their salespeople are just basically starting from scratch like they have nothing. So sales enablement and CRMs bring that together, and you don't realize it, but you're saving money during the sales process. Oh yes, you're saving a lot of money. What you just said is interesting, because you said like, "Oh marketing is all about the email and the social." Well guess what, guys? The new sales channels are email and social. And so, if you're not really good about using email as a salesperson, or engaging with customers online through the social channels, you're missing a ton of opportunities out there. So let's remember that good salespeople should be thinking like marketers, in that you need to be where your customer is. So if your customer's spending a lot of time in the inbox, why aren't you there regularly checking in on them? And are you doing that manually and forgetting sometimes, or is it set up automatically? Yeah. It's really important to remember that this is next level sales, this is a next-level way of thinking about your sales and marketing initiatives and taking your business to the next level and really growing it, because it helps everyone in your sales department reach their quotas. Because you're giving them all the tools necessary. There's no excuses left. They can't come back and say, "Well, I didn't have this" and the standard objections that you usually get when your sales team isn't hitting their goals. You're actually providing them everything that they need, and saving in the long run. There's probably an upfront investment to try to get a CRM going and buy in and whatnot, but you're helping everyone reach their quotas by giving them their tools, and then also creating standards that can be repeated over time. So you get new sales people in and they're able to to follow that process without thinking twice. How exciting is it, from a salesperson's point of view, if the head of marketing could go to the head of sales and say, "Listen, I'm about to find you a way that you can give your salespeople 50% more time to reach out on a personal level to people." If they could automate half of their work as a salesperson, from my point of view, I would be like, "Yeah. Sign me up for that." Unfortunately, marketers are not always very good salespeople on the flip side. So, we have a hard time selling the idea of automation and CRM and sales enablement tools because the way we sell it it's like, "We're going to get tons of data on your customers. We're going to see what your customers are doing." And the salespeople are like, "Hmm. I don't know if I want that, because these are my customers and I worked so hard to build these relationships, I'm not just passing them over to you." And I think as a good marketer, what you have to do is sell it a little better. You have to explain, "Listen we know those are your accounts. We're going to take good care of them. They're in good hands. We're not going to give them to anybody else. They're gonna be yours." So I think salespeople are sometimes worried about conflict among other salespeople, like am I going to get my commission at the end of the day? Hello, that's what it's all about. So, we want to make sure that we alleviate those concerns by explaining to them that this is going to help them automate their existing processes. This is going to help them find more time to build new revenue channels. But those are the things that salespeople do not want to hear, because they don't care about transparency. All that sounds is like big brothers gonna be watching me, checking up on me, making sure I hit my quota. So, we have to be careful the way we sell it. And I think a lot of marketing directors aren't doing the greatest job selling CRMs and selling sales enablement. That's why it's not a word. It is! I Googled it, but when you're getting ready to launch a sales enablement program, have that message come from leadership when you're getting ready to launch it so they can really sell the idea, because everyone that's in your sales team is most definitely an A personality and they want to hear it come from another A personality, on like what those benefits are and that they're not going to get screwed over ... because that's really what they feel like is gonna happen. Right, that's what they're concerned about. Yeah. Awesome. 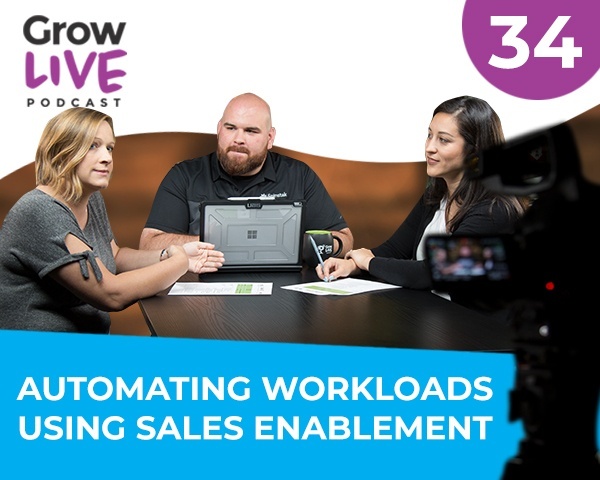 So, one of the things that I wanted to point out is that we did talk about sales enablement back on Grow Live episode 15. In fact, I gave you 10 tips, 10 ideas of ways that you can enable your sales team if you're a marketer. So I definitely want to recommend that people go back and listen to that episode, because those are pretty cool things I said, if I do say so myself. Those are some good ideas. So, you can have those. Also, I want to say that sales enablement is, it's also as much as it is about software and automation, I think that's what we're primarily talking about today, there's other traditional ways of coming along your sales team, making sure that they have the right things that they need. So, when you think about like helping them create a process for some of your traditional sales methods like, for example, trade shows ... that's another area where we're lacking a lot of cohesiveness between marketing and sales. So sometimes it's just a matter of the sales team comes to the marketing team and says, "I'm going to a trade show, get me a table skirt and a banner." And so the marketing team is like, "Sure, whatever you want. Here you go." Yeah, and then they come back from the trade show and they're like oh I'm empty handed. I haven't spoken anybody. So what I would say is that if marketing can get a little bit smarter about how they come alongside in those instances, like for example sit down together, talk about ... This is why I believe marketing leads this thing, because I think sales is going to lead on the relational side, but marketing should lead in processes and strategy. So, I would say let's get together, let's talk about what are we going to get out of this trade show? What are we going to come home with at the end of the day? How many leads are we going to get? And then once we have those leads, what are we going to do with those leads? And let's build out a process that we can repeat for each one of these shows that we're going to, so that we can work like a fine-tuned machine instead of like a guerrilla marketing sales efforts. So yeah, that's an example. One of many, I think, that we could probably talk about but that's what I seen a lot of times is that marketing is serving like a support team where it's just you know taking orders and fulfilling tasks. And I think marketing leadership, think about how do I come alongside and work together on strategy? And this is something that all CEOs want. For every company that I've worked for, small business to Fortune 500s alongside some of those departments, everybody's looking for a way to build processes for their sales team. Oh, we have to improve this. We have to we have to align it, and it's always something that gets put on the back burner which really doesn't need to get put on the back burner. It's something that you can address now. So I would take action on it. Even if it's not perfect at first. That's part of the process. You go through and you create a program, and then wherever your salespeople are finding breaking points make sure that they're reporting that back to the marketing team, so that the marketing team go back and adjust the strategy and address the program that's in place. It has to make sense. So, let's close this out. Hopefully that was helpful for you guys, but I think we should close out with some best practices and then we're going to ask that you go back and watch Grow Live 15 and take some notes from there. All right. So, creating a program and clearly defining it. Misti just touched on that, that's really important. Just start somewhere. You have to start somewhere. What does your sales process look like now? Get your marketing team involved. Excuse me. And then start defining what those processes mean and what the end result is. That's why you always come with a cup of water. I know, I miss my water. Yeah, I think where we often get stuck in this area, where companies get stuck, is like they get the paralysis ... What do they call it? Paralysis by analysis. It's like this idea of there are so many CRMs, there's so many options, there's so many ways that I could put this program together it's intimidating. And I think what we need to do is remember that you're not getting married to anything. You're basically just saying I'm going to try this out. I'm going to give it my best shot, and get the ball moving because much like a website ... and we talk about this a lot with the idea of growth driven design, but you don't know what you don't know. You have to get in there and see how people are using it. What is the customer experience? What kind of data are you getting? What kind of tools are you able to use? And I know that a CRM can be a big investment, which is why a lot of today's CRMs have like free starter programs. 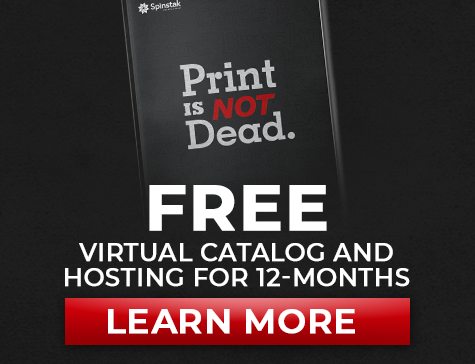 Like I know HubSpot, our software partner, offers a free CRM that you can get in there. Start trying a lot of the tools and you know see how it works for you, and start ... You can actually build an entire system and a process using HubSpot's free CRM, I know they're not the only one who does it, but that's an example of a way that you can just get started building the process, and then get the ball rolling from there. You can slowly increase the complexity of your program over time. Yeah, just get somebody in there and just start building out those sales processes with the marketing materials you already have in play. Right, because there's a process in place, it's just not defined or documented, and maybe everybody's following a little bit of a different process. So, it's just kind of aligning everybody. I like what you have here in the notes, to make it all about the buyer, not the salesperson. And this is where marketing can really complement sales, because sales tends to be on the aggressive, maybe on the colder side. It's like, "I'm going straight to the jugular, straight to the close." Like, you know, "Always be closing" the Alec Baldwin quote. But we have to remember that marketing can come alongside of that message, maybe soften it up a little bit, and consider what the experience looks like because that's the way our minds think. We're thinking about experience. What does it look like? What does our emails look like? Are they too long, or are they too short? Do they have just the right amount of information? Is the subject line right? These are things that your marketing team can help you think through, and that's why marketing and sales can work so good together. It's dry in here, today. ... actually of value to the people who are receiving it. And that's where you have to do a little bit of research upfront to figure that out. It's not going to be a perfect answer every time, but you've got to know your personas, got to know who they're targeting, so that you can provide content that matters to them. It goes kind of in line with all about the buyer, not the sales person. It's not about, "Oh I've got this cool thing. Here's everything about it." [crosstalk 00:26:09] Here's why you should buy it. It's about the benefit of those services or products that you're offering. Content needs to be more than a spreadsheet with pricing. That's what I would say. We need to think about "How do we create a better user experience?" Think about the Amazon experience. What do you see when you go to our Amazon product page? You see reviews. You see a detailed description. You see images, multiple images. How about video? These are things that are going to help you as a sales team, and you need your marketing team to do that. So, your sales enablement program needs to be about high quality content, and we talk about that a lot in Grow Live 15. Yeah, awesome. And then we talked about it earlier, it's just always training salespeople on how the programs are working and how they're automated, or how they're tailored and targeted. You may offer several lines of products or services, so the messages that go out and how those leads come in are going to be tailored to that prospect is interested in. Train your salespeople on how they're being delivered and how they're automated so that there's no duplication in communication, and no one's caught off-guard. We talked a lot about sales and marketing, Smarketing, working together in previous episodes; we'll link to those in the show notes, but just kind of closing on the idea of closing the feedback loop. So, you like I did that. So we're going to close the feedback loop, meaning sales and marketing, let’s hear from each other. Let's hear what we're doing. Marketing, let's communicate to sales what we're planning, what's the strategy, what's the go to market? What are we promoting, what content is out, what content's fresh that we can share with our customers? Sales, let's go back to marketing, let's talk about what you're hearing in the field. What are your customers asking for? What are your customers saying? What are their questions that they're hearing out there? And when you guys can talk together on a regular basis, and we highly recommend the monthly smartening meeting, but when you close that feedback loop you both start getting better and better and the whole organization arises with you. So that is where I kind of end it today, is just this idea of pulling those two teams together, having good Smarketing conversations to help you improve your sales and marketing programs. Yeah, that's a good way to grow. Just get started. All right, awesome. So, I'd just like to ask you guys out there watching or listening to the show to share your sales enablement experiences in the comments below. Let us know if you have a story about you know implementing a CRM system. Have you worked together with your sales team to build processes? Have you worked the other your sales team to deliver content? These are fascinating subjects to me. I know it's kind of nerdy, but we are nerds and ninjas and we like those kind of things. Let us know in the comments below, either on YouTube or on Facebook Live, and we would love to respond to you, send you some cool swag. You can always visit us online at Spinstak.com, or you can even pick up the phone and call us, 866-270-0810. So you can call us on the line, and we'll be glad to talk to you. You can set up a meeting and we would love to discuss what you're doing with your sales and marketing teams, and how maybe we can help. All right. Anything else guys? Okay. Thanks for coming on. See you all next week on Grow Live. Have a good week.